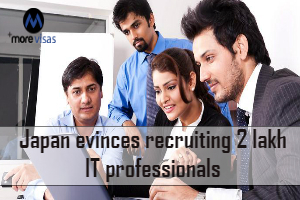 Japan evinces interest in recruiting 2 lakh IT professionalsJapan recruiting indian it professionalsShigeki Maeda, the Executive Vice President, of Japan External Trade Organisation, JETRO, has stated that Japan is seriously considering welcoming Indian IT professionals in a big way, numbering around two lakh. It will grant Green Cards for them to settle down in Japan, for extending valuable support to the emergent IT infrastructure in the country. At present, there are 9, 20,000 IT professionals, but it also faces an urgent demand to have 2, 00,000 additional IT professionals. This shortage is likely to increase to 8, 00,000 professionals by 2030. The technological innovations are happening at a great pace, and this is necessary to meet the societal needs. Japan wishes to fill this gap, by reaching out to seek assistance from India in the IT sector. The companies in Japan have felt the limitations of in-house innovation, and have decided to move to increase their Information Technology Capability. They feel that India can serve as an ideal partner, and deliver promising results. Japan is ready to adopt the innovative approach and seek emerging technologies, for transforming the manufacturing methodology. At present, because of the thorough process, there was a shortage of trained and qualified professionals, in Information Technology, for improving the competitiveness in the life-science, financial, agricultural and services sectors. He further stated that the government in Japan will issue Green Cards, for top-notch professionals, and help them to obtain PR status, in just one year. This is one of the fastest measures to give the residential rights in the world. The new norms specify that the applicants need not submit Letters of Explanation and Employment Certificates while seeking multiple-entry visas. The documents required for submission, have been reduced to three. When a person, undertakes a travel to Japan twice in a year, the documents are reduced, to merely two- the Passport, and the Visa Application Form.